4 Bedrooms, 3.5 Bathrooms, 3164 Sq. Ft. Designed specifically for the growing family, this home features 4 bedrooms and lots of room for gathering. 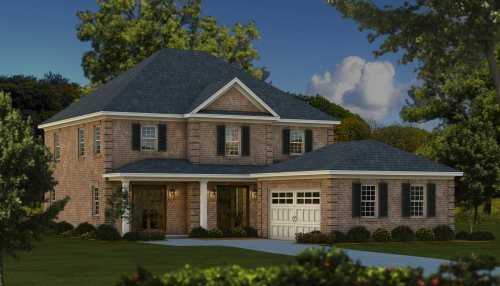 As you enter the home, you’ll get a breathtaking view of the wide open formal dining room, family room, kitchen, cafe, and outdoor living area. To maximize gathering space, the only separation between the main living areas is detail work on the ceilings. The dining room is adorned with elegant columns and features a large wall for furniture and double doors to the front porch living area. The kitchen features luxury stainless steel appliances including gas cooktop, huge granite-topped island that seats up to six, and plenty of custom cabinets. And, if you thought that wasn’t enough cabinets, the cafe features an additional wall of cabinets. For more storage area and convenience, the walk-in pantry is tucked out of the way next to the owners’ entry with built-in drop. The family room features a gas fireplace with decorative mantle and large scenic window overlooking the outside living area. Downstairs you’ll also find a large den, perfect for an office or additional media room. Upstairs you’ll find 4 bedrooms and a loft. The master bath features a large walk-in closet, water closet, corner soaking tub, separate vanities, and tile shower.